Al Foss was an iconic name in the fishing world during the first half of the twentieth century. Having developed some of the most popular fishing lures ever made, he barnstormed the nation demonstrating his pork rind baits and showing movies of his fishing trips. 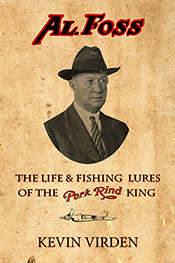 By the mid-1920s he was known as the “Pork Rind King” and even after he sold his company in 1929, his name was still used to hawk a line of fishing lures well into the 1960s. 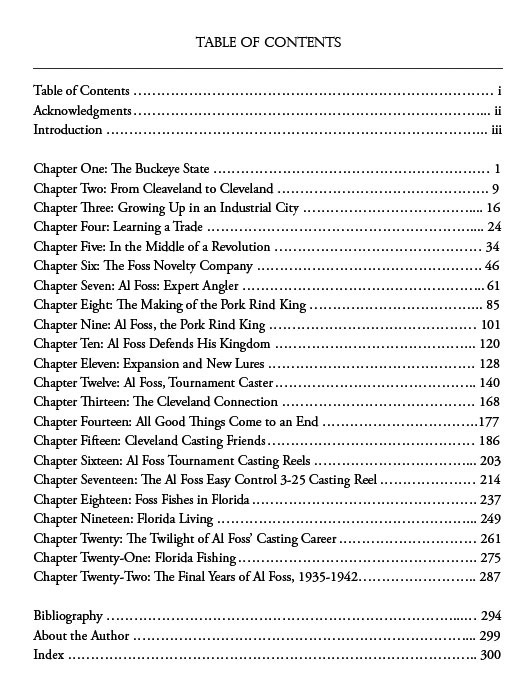 Al’s fishing tackle business is well documented in this book, from the origins of his tackle company in 1915 to how he patented and defended his ideas in court. Kevin Virden, the author of a well-received biography of Fred Arbogast, details the fascinating life and career of Al Foss in this book, the famous angler’s first full-scale biography. Al Foss is best known for fishing tackle, but there is much more to his story. From his humble beginnings in Cleveland to his successful career in the telephone and novelty industry, Foss is revealed as not only an inventive genius, but also an astute businessman who built and sold two successful companies before entering the tackle field. Having “retired” from the gaming business in 1915 he embraced the new phase of his life as a tackle maker and a tournament caster, winning contests around the country and setting records along the way. He also became a noted angler, and having moved to Florida, a great proponent of fishing and conservation in the Sunshine state. His later years were spent promoting tournament casting and his adopted home state of Florida. Al Foss was a genial and beloved character, a legendary lure maker, and the one and only Pork Rind King!